Home Basketball Scariolo: "Marc Gasol will provide the team with something he never had"
Scariolo: "Marc Gasol will provide the team with something he never had"
The Spanish coach praised the center: "He is a very deep, intelligent, emotional and motivated guy, he learned to control his character". The Spanish basketball coach and assistant coach of Toronto Raptors, Sergio Scariolo, has assured that it is fortunate to have "close" to a player like Marc Gasol, who is "at his best", and has stressed that he is able to see " the next play a fraction of a second before " than his rivals, besides pointing out that he moves" by the heart "and that he will contribute to the Canadian team something he" never had ".
" He's a very deep guy, very intelligent; He is an emotional guy and he is motivated, he learned to control his character He is mature, he has a family, but still he is an emotionally motivated man, always moving through the heart. He is a great family man, a very good teammate, very good help for the coaches also because he has a great mentality, he's a great guy to have close, "he told the media after the victory against New York Knicks (99-104) . He affirmed that the Catalan center contributes new virtues to the Canadian franchise. "Probably brings to this team something he never had, he's a type of player who never had this team. Basically, he's a great passer, someone who sees the next play a fraction of a second before most of the rivals, most of the teammates and, also, the majority of the coaches, I would say that he is a very versatile player at the moment ", he said. In this sense, he believes that he is going through the sweetest moment of his career. " He is at his best, at the peak of his career, in terms of maturity, ability to join a team and do what the team needs to win," he said. 4 Marc Gasol: "The team communicates well and is not very selfish"
The Spanish power forward Marc Gasol was "happy" after his debut with the Toronto Raptors, although he acknowledged that he needs a period of adaptation to his new team. 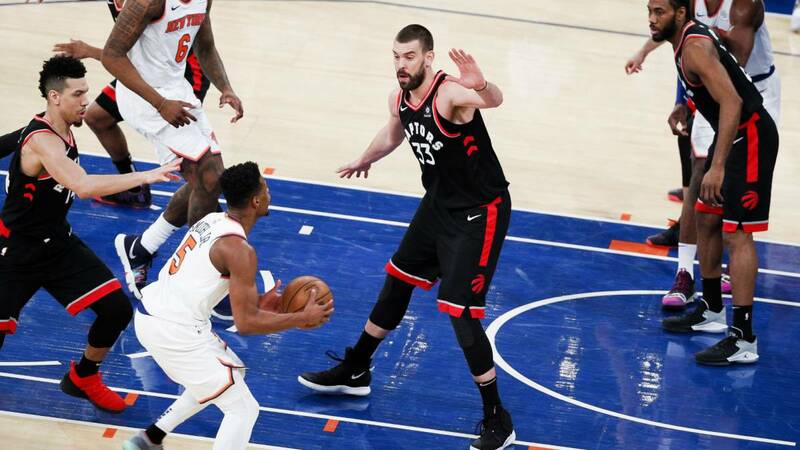 Trailed by the Memphis Grizzlies, Marc Gasol contributed 7 points in the 19 minutes he was on track in his debut with the Raptors against the New York Knicks (99-104) . 111 1111From his new team in the NBA, the player from Sant Boi stressed that "everyone fights, everyone fights and communicates very well" . "Everyone is very unselfish the truth and very well, I am very happy, "he said in statements provided by the NBA. Marc Gasol yes exposed, however, that needs a period of adaptation. "In the end it's basketball, but all the world has its tendencies, its plays and it takes time to learn where you are going to receive the ball and where the other players like to receive the ball, it has its process, but the truth is very happy", abounded.